For thoughts on the two big transactions of the week – Buffalo’s waiver claim of LB Shawne Merriman and Tennessee’s claim of WR Randy Moss – check out this post from earlier in the week. 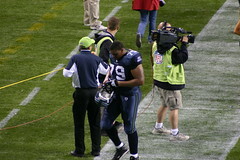 Seahawks (put DE Red Bryant and C Ben Hamilton on IR; cut RB Quinton Ganther and S Nate Ness; add DT Frank Okam, DE Jay Richardson, WR Ruvell Martin, and C Chris White) – The Seahawks lost two starters to injury in Bryant, who has a knee injury, and Hamilton, who has a concussion. (Bryant is pictured above.) Both are key losses for a team that’s fighting for the NFC West title. Finding Okam, who played five games for the Texans this year, was a plus, and Richardson has three years experience in Oakland. Both guys should be good enough to plug into the rotation on the front four. Martin has been a Packer and Ram, and he plays special teams as well. Ness was immediately claimed by the Dolphins. Chargers (put WR Buster Davis on IR, add WR Kelley Washington) – Davis, a former first-round pick, is the latest in a line of Chargers wideouts to be sidelined. Malcom Floyd and Legedu Naanee are currently out, and it appears TE Antonio Gates will miss time as well. San Diego still has several weeks to wait before Vincent Jackson makes it back from his suspension, so Patrick Crayton, Washington (most recently with the Eagles), and Seyi Ajirotutu will have to hold down the fort for now. Buccaneers (put DT Bryan Price on IR, add DT Al Woods) – Price, the Buccaneers’ second-round pick this season, hadn’t broken into the starting lineup, but he was one of the youngsters who really added play-making ability to a defense that’s coming around. A pelvis injury now sidelines him for the rest of the season. He’s replaced by Woods, whom the Bucs took off the Steelers’ practice squad. Woods could be a nice developmental prospect. 49ers (put C Eric Heitmann on IR) – Heitmann, who has been the 49ers starting center in previous years, had not yet played this year because of a neck injury and a broken fibula. The Niners tried to wait on his return but decided this week to cut the cord for this season. Texans (cut DE Adewale Ogunleye) – The Texans have brought in several veteran defensive ends this year, but they decided Ogunleye wasn’t performing up to snuff. So they released him and promoted Tim Jamison from the practice squad. Panthers (claim LB Jason Williams) – Williams, a third-round pick in 2009, lost his job in Dallas, but the Panthers immediately claimed the Western Illinois prospect to see if he can develop there. Even though Williams has played just 10 career games, he’s still a better bet to develop than retread Abdul Hodge, whom the Panthers cut after just one week on the roster. It’s summer, and that means it’s time to start our fantasy football preparation for 2010. The first step is to identify the Tier 1 players at running back, wide receiver, and quarterback. In this post, we’ll identify the Tier 1 guys (aka The A-Team because of this summer’s movie relaunch) at wide receiver. Check out the running backs here and the wide receivers here. Definition of an A-Team player: A guy you can legitimately build a fantasy team around. He can’t just be a no-question starter; he has to be a stud who will produce even more than an average fantasy starter at his position. For a quarterback, that means throwing/scoring 35 touchdowns and 4,500 yards. For quarterbacks, that includes guys who make their way onto Tiers 1A, 1B, or 1C. Drew Brees, Saints – Brees continued his dominant play in New Orleans, passing for 4,388 yards and 34 touchdowns. He’s thrown for at least that many yards in his four years as a Saint, and he has thrown 34 touchdown passes in each of the last two years. Brees also added two rushing TDs last year to cement his dominance. Brees has a ton of targets, so even an injury to his top target Marques Colston won’t substantially damper his fantasy ceiling. Brees’ phenomenal performance puts him at the head of the class for fantasy quarterbacks, and makes him an A-Team guy. Out of a group of quarterbacks with closely bunched stats, Brees stands above the pack. Aaron Rodgers, Packers – In his second year as a starter, Rodgers took a step forward, going from 4,038 passing yards to 4,434 and from 28 touchdown passes to 30. That step forward is the difference between a good fantasy quarterback (which there are a bunch of, as you’ll see) and an A-Team guy. The underrated thing that sets Rodgers above the pack is his ability to run. Last year, he ran for 316 rushing yards and five touchdowns, after running for 207 yards and four touchdowns in ’08. Those rushing stats last year gave him the equivalent of a 5,000-yard, 40-touchdown season, which are ridiculous quarterback numbers. 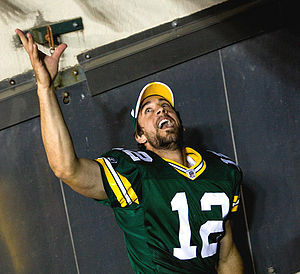 And since Rodgers has run the ball well two years in a row, we can consider it part of his arsenal and not a fluke. If you’re wondering what separates Rodgers from the quarterbacks below him on the list, it’s those running stats. Peyton Manning, Colts – Manning has long been the elite fantasy quarterback, but this year our first instinct was to knock him off of the A-Team. But Manning’s numbers – exactly 4,500 passing yards and 33 touchdowns – were basically the A-Team borderline last year. And although those are actually Manning’s best season numbers since his record-setting 2004 season, Manning can do it again. With top targets in Reggie Wayne and Dallas Clark and emerging youngsters in Austin Collie and Pierre Garcon, Manning suddenly has the best group of targets he’s had since Brandon Stokely, Wayne, and Marvin Harrison were in place. At age 34, Manning is closer to the end of his career than the beginning, but he has enough of his prime left to include him on Tier 1C for one more year. Matt Schaub, Texans – Schaub has as much fantasy upside as any quarterback this year aside from Brees, and he proved last year that when he stays healthy he can put up huge numbers – 4,770 passing yards and 29 touchdowns. Schaub has perhaps the most talented wideout in the league in Andre Johnson, and top-flight TE Owen Daniels returns as well to add to a deep group of receivers. So in a vaccuum, Schaub is a Tier 1 guy. But injury history keeps Schaub off the A-Team, since last year was the first time in his three years as a starter that he played more than 11 games. Schaub will put up huge numbers when he plays, but the nagging concern that he won’t play enough drops his fantasy stock ever so slightly. Tony Romo, Cowboys – Romo has had elite fantasy seasons, with 36 touchdowns in ’07 and 26 in just 13 games in ’08. Last year, he had a career best in passing yards with 4,483, but that came with just 26 touchdowns. Other numbers like interceptions and quarterback rating suggest that Romo is entering his prime, and the emergence of Miles Austin as a No. 1 target along with the presence of Jason Witten and the addition of Dez Bryant are good signs. But because of Romo’s touchdown slip last year, we’re going to keep him off the A-Team. He has the potential to end up with the elite guys at the end of the year, but owners are wiser to slot Romo on Tier 2 for now. Tom Brady, Patriots – After missing almost all of the 2008 season with a knee injury, Brady returned with a big season in ’09 with nearly 4,400 passing yards and 28 touchdowns. With Randy Moss in place, Brady has a top target, but Wes Welker’s late-season injury takes away a huge part of the Pats’ passing game. And behind Moss and Welker, the Pats have an inexperienced crew of receivers that could struggle enough to limit Brady’s fantasy numbers. Brady’s still a fine quarterback, and he proved last year that he’s healthy, but the situation around him limits his fantasy upside this year to about the numbers he posted last year. And those numbers put him on Tier 2, not with the A-Team on Tier 1. Philip Rivers, Chargers – Rivers is a terrific quarterback on the field, but owners saw last year that he’s not among the fantasy A-Team. After throwing 34 touchdowns in 2008, Rivers slipped down to 28 last year. Plus, Rivers’ yardage total topped out at 4,254, which puts up a notch below the Brees/Rodgers/Manning/Brady/Schaub level. Rivers is a good fantasy starter, and he has good targets in Vincent Jackson and Antonio Gates. But Rivers is clearly a Tier 2 guy who slips below the elite fantasy producers at the position. Brett Favre, Vikings – Despite all the offseason hand-wringing about his status, the king of separation anxiety had a terrific fantasy season with 33 passing touchdowns, 4,200 yards, and just seven interceptions. Spanx turned Sidney Rice and Visanthe Shiancoe into elite fantasy performers, and his young receivers should only be better this year. Favre’s absence during offseason work is a small concern, and at age 41 entering the season Favre could pretty quickly slip in his performance level. For that reason, we’ve got to look at Favre’s 2009 numbers as an outlier and slot him at the end of Tier 2 instead of among the A-Team for 2010. Ben Roethlisberger, Steelers – Of course, Roethlisberger can’t be an A-Teamer since he’s facing a three- or four-game suspension entering the season. But his numbers from ’09 – 4,328 yards and 26 passing touchdowns (plus two rushing scores) despite missing a game – nearly put him on the A-Team. Big Ben is a Tier 3 quarterback because of his suspension, but we wanted to note here that he could post Tier 1-caliber numbers once he returns to the field in October. While the 2009 NFL season leaks into 2010 this weekend, the fantasy football season is already over in a vast majority of leagues. Since that is the case, I thought it would be appropriate to give a few 2009 awards for fantasy football excellence. If you have any differences of opinion, or any categories to add, leave a comment. Note that all statistics are through Week 16 of the NFL schedule. Quarterback of 2009: Aaron Rodgers, Packers – It’s a close call between Rodgers (27 pass TD, 4 rush TD) and Drew Brees of the Saints (31 pass TD, 2 rush TD). Brees has outpassed Rodgers 4,388 to 4,199, but Rodgers has 281 more rushing yards, and that’s the source of some hidden points. So this is basically a draw, and so we’ll go with the QB who was drafted later. While Brees was a top-2 quarterback coming into the season, Rodgers fell into the 5 to 8 range in most leagues. The fact that he’s put up No. 1 QB numbers from that spot is a huge boon to owners who passed on Brees, Peyton Manning, and Tom Brady and waited a round or two for Rodgers instead. Breakout quarterback of 2009: Matt Schaub, Texans – In a year where most quarterbacks delivered on their potential, the one true breakout was Schaub, who overcame injuries to play in every game and throw a career-high 27 touchdown passes and for a career-best 4,467 yards. Considering his previous highs were 15 touchdowns and 3,043 yards, and considering that injuries limited him to 11 games in each of the last two seasons, that was a huge step forward. The bottom line is that anyone who took a shot on Schaub in the 10 to 12 range at quarterback was rewarded with a top-6 performance on a weekly basis. Running back of 2009: Chris Johnson, Titans – Johnson was pretty much a consensus top 10 pick entering the season, but he has delivered beyond even that lofty status with 1,872 rushing yards, 483 receiving yards, and 14 total touchdowns. While he’s a tick behind Adrian Peterson (17) and Maurice Jones-Drew (16) in touchdowns, Johnson’s massive yardage total outpaces each of those guys by 600 yards or more. That’s enough to put Johnson over the top. Breakout running back of 2009: Ray Rice, Ravens – Rice had a hard time weaseling into the top 25 at running back before the season, but he blew up with a huge season – 1,269 rushing yards, a RB-best 683 receiving yards, and eight total touchdowns. That’s enough to make him a top-5 running back for the season and a huge benefit to any owner who spent a mid-round draft pick on him. Wide receiver of 2009: Andre Johnson, Texans – Like his teammate Matt Schaub, Johnson played every game this season, and he delivered with 95 catches for 1,504 yards and nine touchdowns. Randy Moss had 13 touchdowns to Johnson’s nine, but with more than 300 more yards Johnson narrowly gets the nod. Breakout wide receiver of 2009: DeSean Jackson, Eagles – Jackson was a borderline top-20 receiver entering the season, but he busted out in a monster way. The second-year man had 1,120 yards receiving, nine receiving touchdowns, 131 rushing yards and a touchdown, plus two punt return touchdowns to earn a spot as a top-5 fantasy receiver. He was the kind of mid-round pick that makes fantasy teams into championship contenders. Tight end of 2009: Dallas Clark, Colts – In an easy call, Clark, who had 1,054 receiving yards and 10 touchdowns, became the clear-cut No. 1 tight end over Antonio Gates, Tony Gonzalez, and Jason Witten. In a year where four tight ends were thought to be at the head of the class, there was only one, and it was Clark. Breakout tight end of 2009: Vernon Davis, 49ers – Davis, who had been a disappointment both on the field and for fantasy owners in his first three NFL seasons, became a monster in 2009 with 72 catches for 876 yards and 12 touchdowns. He was the kind of late-round pick or waiver claim that makes a difference for a fantasy team. Pickup of the year: Miles Austin, Cowboys – Austin didn’t start the first five games of the year for the Cowboys, but once he entered the lineup he blew up with 10 catches for 250 yards and two touchdowns against Kansas City. From that point on, Austin was a No. 1 fantasy receiver, scoring eight touchdowns after his breakout game. If you claimed Austin after that game, he rewarded you with top-5 fantasy receiver performance. No other pickup made that kind of difference. Rookie of the year: Knowshon Moreno, Broncos – It wasn’t a great year for rookies as fantasy forces, but Moreno did a good job for fantasy owners who drafted him as a top-25 running back. With 896 rushing yards, 165 receiving yards, and seven total touchdowns, he provided a nice fantasy threat, especially once he fully got over a preseason injury. So he gets the nod over WR Hakeem Nicks of the Giants, who had six touchdowns and 795 receiving yards. Disappointment of the year: Matt Forte, Bears – Forte was a top-5 pick in many leagues, but his fantasy performance (828 rushing yards, 448 receiving yards, 4 touchdowns) was incredibly disappointing. Take out what he did in three games against the sorry Lions, Rams, and Browns, and his weekly numbers looked even worse. He was barely a top-20 running back and a team-killer as a first-round pick.